1) An Italian term for "cream" that can be used to refer to cream in a food, a cream sauce, or the topping on a dessert or an espresso coffee. 2) A Mexican word, often referred to as Crema Mexicana, that is used to describe a thickened fresh cream ranging in flavor from tangy to only mildly bland with a slightly stiff to thick consistency. It is similar to sour cream but thinner in texture and richer in taste. 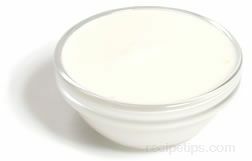 The consistency is similar to Devonshire cream or Crème Fraîche. Crema varies in color from white to pale yellow and when cooked it resists curdling, unlike sour cream. Crema has a high butterfat content, similar to Crème Fraîche, and may be used as a food topping, as a thickener for meat sauces or to give savory dishes a thicker consistency and richer flavor. Crème Fraîche can be substituted for crema. Crema may also be known as crema Mexicana.